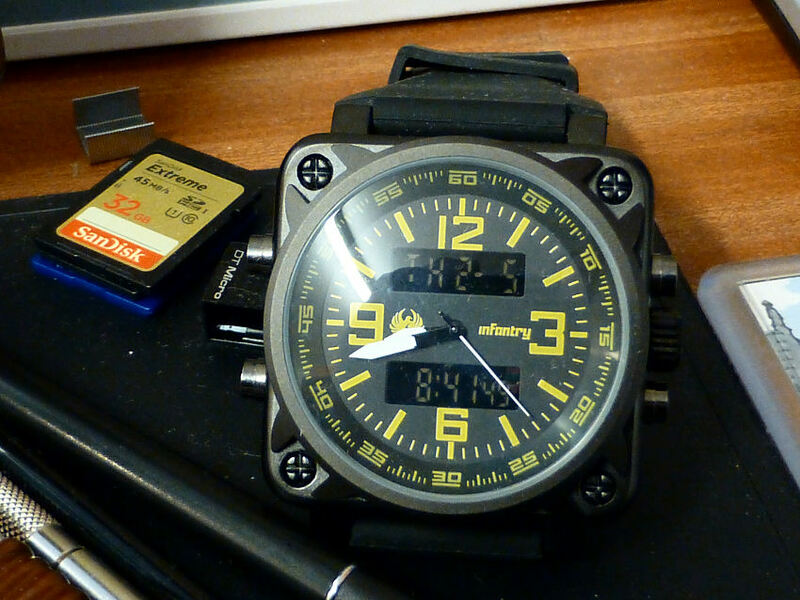 Casio seem to manage a range of inexpensive digital models that almost always meets the “daily beater” format. 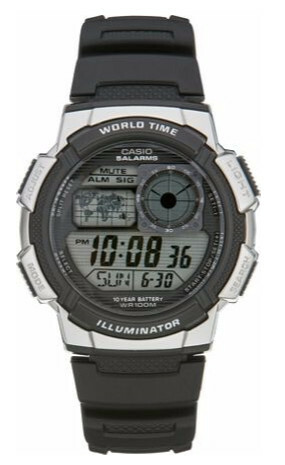 This model – Casio Men’s LCD World Time AE-1000W-1A2VEF is such a one and at a low price of £19.99 in Argos (UK) currently. ( I have also seen it cheaper on offer). Difficult to fault when considering the price and function set. LED backlight, World Time function (48 cities), 1/100th sec. stopwatch, countdown timer and 5 alarms and it’s Water Resistant to 100m. So a take it, wear it anywhere kind of watch. 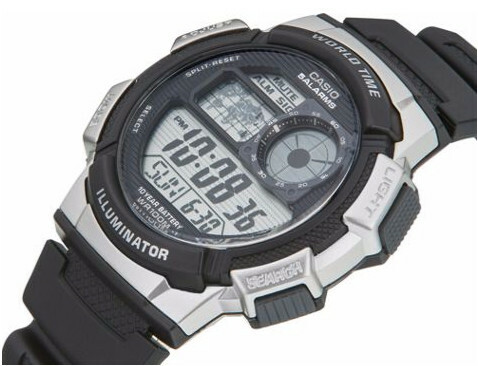 The Casio module 3198 is packed with handy features, including an LED backlight, world time function with map of the world, 1/100th sec stopwatch, countdown timer and 5 alarms. It also water resistant to 100m. With it’s large CR2015 battery it manages a 10 year life. 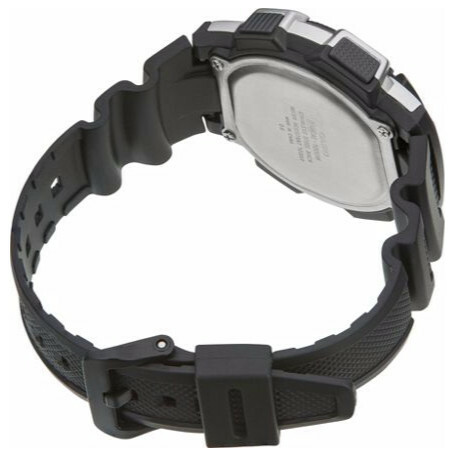 Resin strap with buckle – OK but Casio fit only. The strap is a resin affair, which if honest is not the best but certainly adequate for this price point and has that awkward strap/case fitting which is smaller than the strap width, so tricky to change to any sort of standard strap. Personally I don’t like the rippled strap effect near the case body as it digs in to your wrist. This is fine if this was a divers watch where it was being strapped on to a neoprene suit for example, but being realistic, this is a daily beater everyday watch, not a diver. I do like the fact that the dial in normal mode shows the Time, Day, Date and Month and the small sub dial analog always shows the time. Being a digital display the backlight works just fine, not having to try and light up any analog hands (as there are none!). The Pushers are larger than previous models which is a big improvement (something Timex scored over Casio for some time) and nicely textured so easy to find and easy to use – and no they don’t operate inadvertently. A problem with some Casio watches is the fact they shroud the buttons so well they were/are difficult to find and even more difficult to push – but here sense prevails. Overall this is an up to the minute specification Casio. It’s also a neat watch at a sensible size at just over 43 mm width and light weight too with it’s combination of case resin technology – in my opinion it represents great value and ideal to be included in my bargain basement. Good dial layout and well textured push buttons. Note – A Casio 2 year Guarantee is included. (I first saw this model when it was called the Casio AE1000W-1B (reviewed in “get and forget” Post) – this series is such a success it’s upgraded and tinkered with almost every year – for daily beaters there’s not a lot better). My Post of the above date says it all. 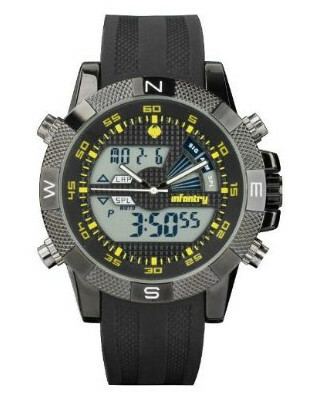 This is another bargain watch, this time from Infantry. Good size at 40 mm diameter and just 11 mm is a classic and at under £15? Model IN-044 Day & Date watch for Gents that only cost me £14.24 inclusive delivery from Hong Kong can’t be bad. And it isn’t – it’s actually quite a neat classic watch, nice size and a good textile strap to boot. Quartz of course and it has a 3 ATM Water Resistance and screwed back. Made from matte black stainless steel. it’s actually quite a decent finish complimented by a very clear to read dial set up. Sometimes you spot something that is so cheap it doesn’t seem possible – but apparently is. 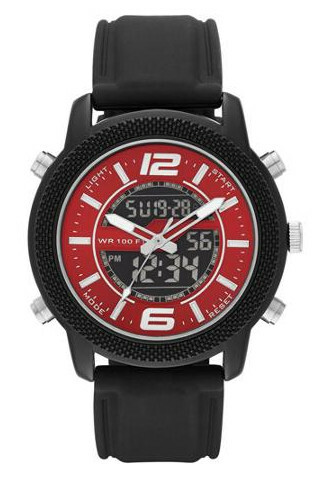 This Quartz black & red, Ana/Digi model is one of ’em . . . . . It says it’s model FMDYM034, though what brand this is, goodness knows. All I know is what you see and I have to say it actually looks pretty good, even if it does the basic Quartz movement functions, it’s got to be a bargain. According to that dial layout script it has a 100m Water Resistance so that’s a great start. It has 4 function pushers, one of which says Start, then a Reset, so odds on there is a chronograph function in there and it also appears to have a back light. And if the image has not been enhanced too much, the digital display appears readable, though only once in your hand can you actually tell if thats the case- and I know this from experience, so beware! It also might, though this is a big “might”, have luminous hands,but realistically I’d guess these are white painted only and unreadable at night, but you never know. It’s not a deal breaker though and the dial color seems to work not too bad otherwise. So there it is – unknown probably Chinese in origin, on offer from Walmart, who had it on their web site for just $12, so what can you lose? It really could be a bargain! Seeing a pal of mine gave me one of these the other day and which I featured in a Post, it really deserves to be listed here. Infantry Military Square thing – and it’s actually pretty darned good! 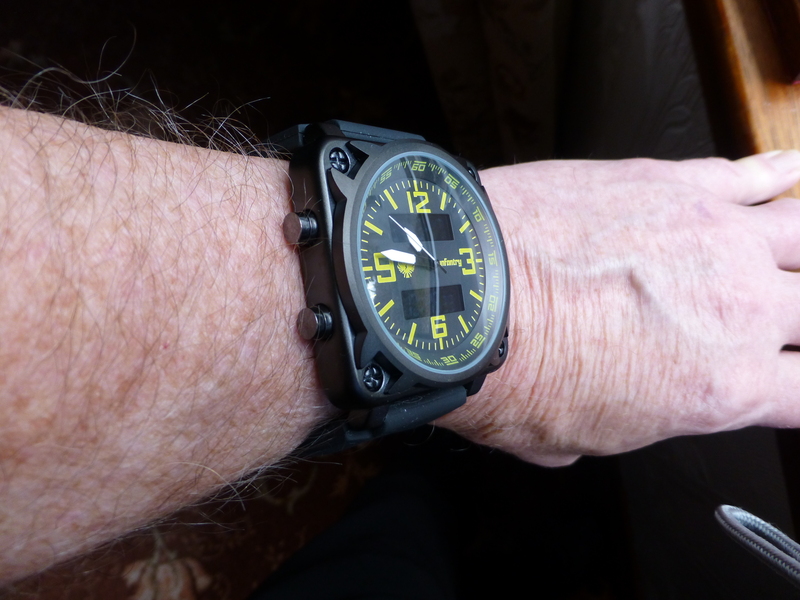 It’s the Infantry Military Chronograph square whatever and apart from the fact there’s no luminous analog coatings, I can’t fault is in any other way – big it is but wears small which is amazing and I never thought I’d like it let alone wear it – and I was wrong on both counts. It’s got a good night light for the digitals and easy to read at night, so it doesn’t need the lume – it keeps excellent time and what can I say – I love it! Oh I almost forgot – it cost £14 . . . . . . .
UPDATE – 5th February 2015 – Well OK I don’t wear it much, but as it sits on my desk every day, I use it as a sort of desk clock and it hasn’t put a foot wrong since I was given it. Perhaps 20 seconds out on time, but for a £14.00 watch I am not complaining – no sir – what can I say? Infantry – value watch – amazing value and going strong! It never fails to amaze me, the wonderfully inventive, military and sports style watches that appear each year from the Far East and mostly at incredibly cheap prices. The fact that digital module prices are so low today means that with some plastics molding equipment, a bit of imagination and flair in design, almost anything is possible. Whether they’ll last of course is another matter entirely, though that said, the basic digital movement could well outlast you! Though any complications outwith the basics could well be another matter entirely. But one thing is certain – they look amazing! and if you don’t take the hype to heart and don’t take them too seriously, probably a bit of fun too. Take the INFANTRY Mens LCD Date Day Black Dial Combo Digital Quartz Watch for example. I mean it looks pretty good and has a fair bit of functionality with Day and Date, Alarm and Stopwatch displays. It cites multi-time zone, though doesn’t specify details). I do like the fact it doesn’t depend entirely on display,s as it features conventional analogue Hour, Minute and Seconds hands too. Another plus is that it takes a conventional fitting rubber strap (nothing molded here) and has a Japanese quartz movement. Mineral anti-scratch glass is quoted and there is also a dial light. Case dimensions are about normal for this type of watch at 47mm x 16mm, at 115gms weight, so quite large but without being totally silly. Then there’s the price – here in the UK via Amazon it’s quoted currently at £14.99. Amazing! Today features two models that are certainly worth a look. Pared down to the basics – the Timex T49949J Expedition. Digital Black, fast wrap strap and 100m Water resistance. 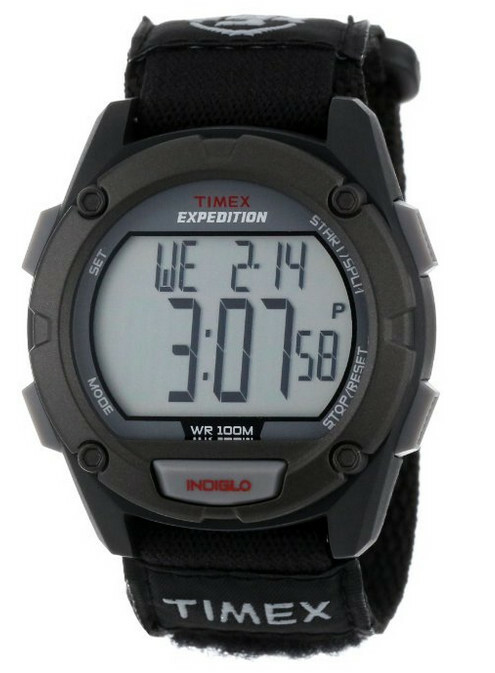 Pared down Timex Expedition T49949J fast Wrap Velcro. Yet another incarnation of the very popular Timex low cost expedition series, this model takes things about as basic as possible without losing it’s attraction. Still has the usual Timex functions set – 4hr Countdown Timer, 3 Daily Alarms, Weekend or weekly Alarms, 2 Time Zones, fabulous clear contrasty display with large easily read data, Day, Date, Month, Time, am/pm etc. Plus Indiglo of course as dial light. As displays goes it’s difficult to envisage a better one, so for a daily beater this takes a bit of beating (excuse the pun). Note, the strap is 20mm wide and is the Fast Wrap Velcro type, which is fine as far as it goes of course, though the overly hairy Timex variety tend to wear/fray with excessive taking off and on. This is not a problem for me as I tend to wear my watches 24/7, but hardly an issue as alternative fast wrap styles are available from just about anywhere and are low priced anyway. Tried and tested formulaic Timex it may be, but it works very well and at the price of £29 here in the UK this represents pretty decent value fore money. And let’s be honest – at such a daily beater Price we have this notion that such a watch can be subjected to quite ridiculous rigors, yet at the same time quite unreasonable expectations of it’s ability to withstand it all – and all for the price of a snack lunch for two plus the parking meter charge! More bargain basement stuff – where models for whatever reason are either offered at amazingly low discounted prices or just happen to be great value for money. Either way it has to be good! 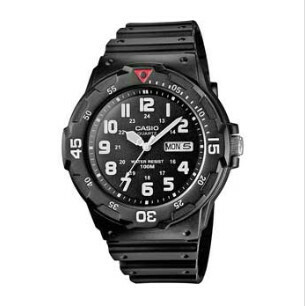 This is the Casio Diver style Model MRW-200H-1BVEF, quartz, 100m Water Resistance and under £15.00! Casio Divers Style at £15.00 discounted – Wow! 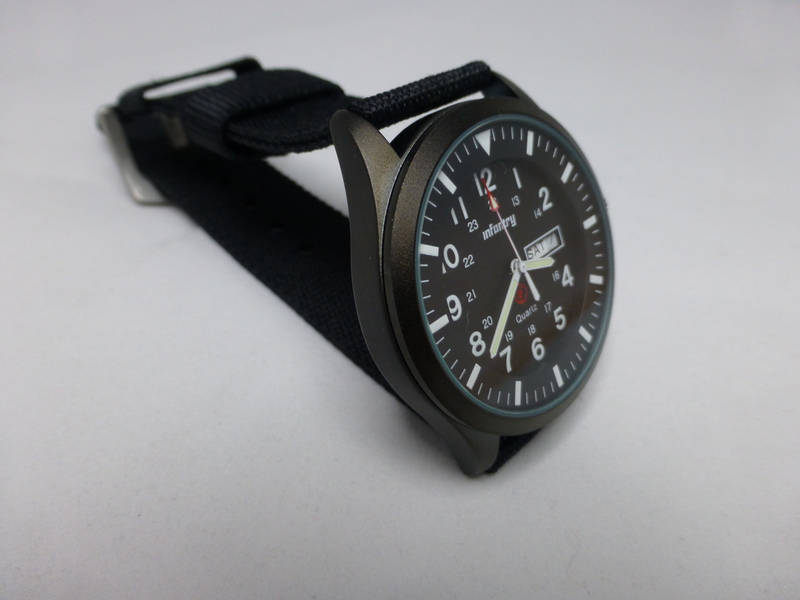 Black background dial with broad hour and minute hands infilled with Neobrite luminous coating on hands and markers and a center seconds hand. Day AND Date window @3 and a Water Resistance of 100m make this an ideal daily beater for any occasion. Rotating bezel with markers and a protected crown within a black resin case with adjustable resin strap. Complete with the Casio 2 year Guarantee, at this price it’s hard to see how it can be bettered. This model was being offered by Argos (UK) – http://www.argos.co.uk/static/Product/partNumber/9025873.htm – as of 31st March 2014.